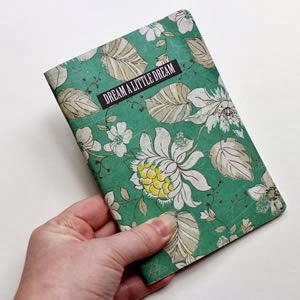 I love it as a crafter, as a graphic designer and as someone who buys lots of notebooks and stationery. For a long long time now I've been threatening to open a little online shop to sell some of my designs. Maybe. I'm mainly planning on making paper products, and possibly some digital things you can print out at home. This is my first 'product', I'm still perfecting it, but this is the first one I've been happy with. It's a small notebook/sketchbook with different papers inside. I call it a Jam book because you can just jam stuff in them. But also it helps 'preserve' your ideas. Get it? Preserve? Well I thought it was funny. I really like notebooks with dots or squares instead of lines so I've made one like that. And I like books that have different pages in the same book, so I've tried that too. I'll let you know if I ever get to, you know, actually putting them in a shop.